When connecting through the login.msi.umn.edu server it may be preferable to use SSH keys. SSH keys provide a more secure form of remote communication. SSH keys also make it possible to securely connect to systems behind login.msi.umn.edu without having to type in one's MSI password multiple times. Below are instructions for how to setup SSH keys for Linux and Windows systems. These instructions assume your local computer has its own SSH client and agent, as is the case on Macintosh and Linux computers. Windows does not include SSH, and using SSH keys from Windows first requires the installation of additional software. login.msi.umn.edu refers to any one of the MSI login nodes. 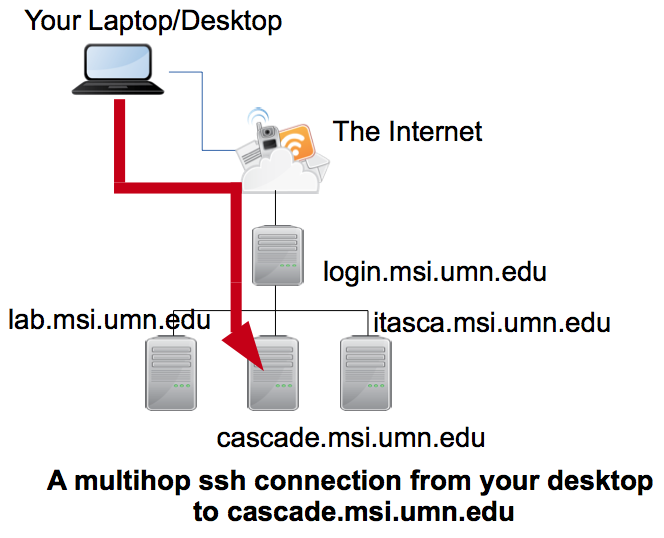 resource.msi.umn.edu refers to any one of the systems behind the MSI login nodes such as Itasca, Cascade etc. msiuser refers to your MSI username. There are two types of SSH key encryptions, named DSA and RSA. RSA allows for larger keys and is what we recommend. The minimum recommended size is 2048 bits. Generate your ssh keys using the ssh-keygen command as shown below. You will be prompted to choose a passphrase for the keys. Please be sure to enter a passphrase. This is the password that will protect your keys. It can be a sentence with spaces between the words. Be sure to use a combination of lower and upper case letters, numbers and punctuation marks. The random art image can be used to visually identify and confirm that you are connecting to the right system. You will now need to set up the SSH agent on your local computer. The SSH agent will remember your passphrase and forward your key on, securely, to systems behind login.msi.umn.edu. This will set up the agent only for the current login session (until you logout). On Windows, keys can be generated with PuTTYgen. Download puttygen.exe and launch the program. Enter 2048 in the "Number of bits in a generated key" field. Enter a passphrase for your new key. Save both the public key and private key on your hard drive. Keep this window open so you have access to the "Public key for pasting into OpenSSH authorized_keys file" as you'll need this later. SSH to login.msi.umn.edu with PuTTY. Use a text editor (such as 'vi', 'emacs', or 'pico') to open the file "~/.ssh/authorized_keys"
You'll need to use pageant to store the key. A tray icon will appear for pageant. Right click and select "View Keys". Select "Add Key" and choose the key previously generated. You will need to enter the passphrase. Right click your desktop and select "New > Shortcut"
When you click this shortcut, pageant will automatically load the key you specified. It is possible to configure SSH keys to allow multi-hop connections using a single command. The method for doing this on Linux and Mac systems is outlined below. In this example config file two systems are defined (itasca and lab). To connect to one of them you can type ssh hostname (eg. ssh itasca) from the command line on your local system. The username used in the config file needs to correspond to your MSI username. To function correctly the config file needs to have access permission 600 (chmod 600 .ssh/config). This config file would allow you to connect to the Itasca and Lab systems, via an intermediate connection to the login node (see the above diagram). SSH keys would be used to verify your identity.